May I make an impassioned plea through the pages of your magazine, which I have now been buying since 1964, for the release on CD of what I (as I am sure do many others) consider to be one of the great recordings of the 20th century? 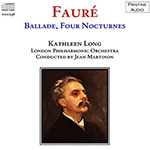 Dutton Laboratories has already released Kathleen Long's 1944 recording of Fauré's Ballade (with the NSO conducted by Boyd Neel) together with two Mozart concertos and Walter Leigh's Concertino. However, she re-recorded the Ballade (conducted by Jean Martinon) as well as recording the Theme and Variations and some Barcarolles, Impromptus and Nocturnes in the early 1950s for Decca's long-playing LXT label. The performance is very similar - achingly beautiful - but the recording is vastly technically superior. None of the later recordings has ever been released on CD - I had the reissue of the Ballade and the Nocturnes (accompanied as on the original with Françaix's Concertino) when it was reissued on Ace of Clubs years ago, and that seems to be the last that was heard of her LP recordings. Please, Universal and The Gramophone, can you assist? When I read this letter I was immediately intrigued to hear the recording - to describe it as "one of the great recordings of the 20th century" is strong stuff indeed! It also struck me that here was an ideal opportunity to use the power of the Internet to bring this recording back to life in double-quick time - in time even to get a reply published in the following issue. First step was a search for discs to work from, to which we are indebted to Watson Records of Dundee for their helpful and efficient manner - and of course the discs involved. I'm pleased to say that they have also located further records by Kathleen Long which will be appearing here in the months to come. Working from the original Orange/Gold label Decca LXT pressings (with reference to the later Ace of Clubs release) I discovered how well these early discs could be made. Indeed, although the surface noise was lower on the later release, there was no doubt that the original possessed a finer and sharper sound. My suspicions that the later Ace of Clubs was mastered from a copy of the original tapes is bolstered by the fact that the recording is out of phase with the original LXT issue, as well as having increased hiss and less resolution. From then on it was a matter of bringing this beauty back to life - not until I was sure that it would be possible did I confirm with editor of The Gramophone that this would be going ahead in time for their April issue - better to get it right than to rush it out. One problem surfaced late in the day - a variable wow on the Ballade left the piano at times sounding a little wavery. Here I adopted the methods used so succesfully by my colleague Peter Harrison for our César Franck Piano Quintet release to digitally de-wow the recording by degrees varying from 0.08 semitones at the start to 0.15 semitones at the end of the recording - minute amounts, but when you know they're their you can hear them and they do become an itch you have to scratch! So here it is, some 53 years after its original release, and sounding perhaps better than it ever has done. We are now in the process of remastering more of those rare early Decca LPs to continue a Kathleen Long series, including works by Fauré, Schumann and Scarlatti. We hope you enjoy this fabulous recording, and thank The Gramophone and Mr. Arnold for bringing it to our attention.